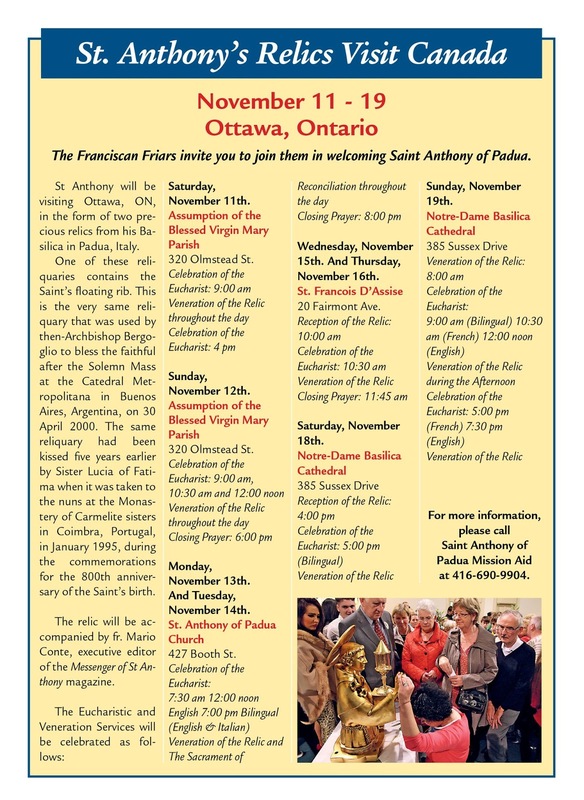 The Franciscan Friars of Saint Anthony's Basilica in Padua, Italy, will be bringing two precious relics to Ottawa, Canada, from Saturday, November 11th. to Sunday, November 19th. The first reliquary contains fragments of St Anthony’s skin and will be fixed on a golden statue of the Saint, which the devotees will actually be able to touch. The second relic, a fragment of St. Anthony's floating rib, was the one venerated by Sister Lucy, one of the three Seers of Fatima. The reliquary, therefore, has special meaning this year as we celebrate the 100 year anniversary of the Fatima apparitions. 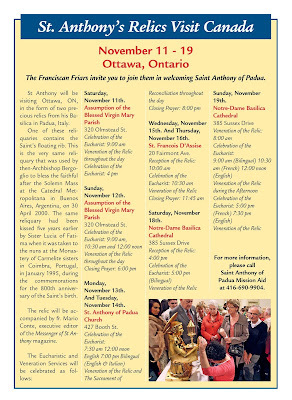 Click here for the Eucharistic and Veneration Services program.